Blue Raster is proud to announce the launch of Eyes on Nigeria for Amnesty International, the world’s largest human rights organization. Created using ESRI ArcGIS Server and Flex API, this application utilizes satellite imagery to track developments on the ground in areas of Nigeria where there are ongoing human rights concerns including forced evictions, pollution, violations of international humanitarian law, and communal violence and armed conflict. The project was led by Amnesty International’s Science for Human Rights Program, in collaboration with the American Association for the Advancement of Science (AAAS). 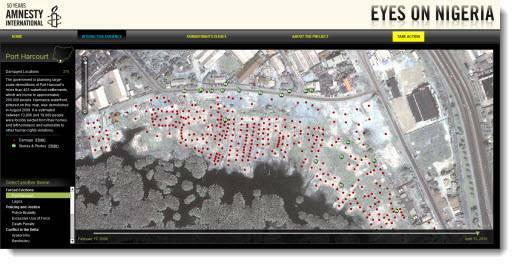 To see how Amnesty International’s Eyes on Nigeria leverages the power of geospatial technology to map human rights violations please visit www.eyesonnigeria.org. For more background on the project go to Amnesty International’s News and Events, Amnesty International UK, Amnesty International’s Blog, or AAAS.